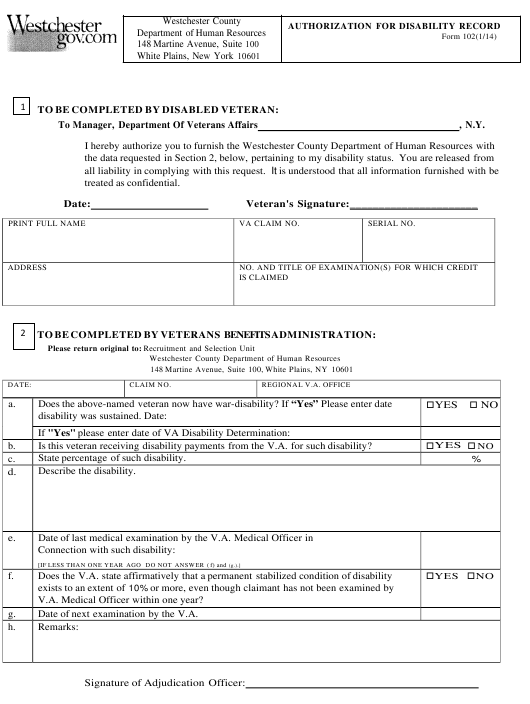 Form 102 is a New York State Department of Labor form also known as the "Authorization For Disability Record (disabled Veteran)". The latest edition of the form was released in January 1, 2014 and is available for digital filing. Download a PDF version of the Form 102 down below or find it on New York State Department of Labor Forms website. Is this veteran receiving disability payments from the V.A. for such disability? State percentage of such disability. V.A. Medical Officer within one year? Date of next examination by the V.A.